Brussels sprouts prefer cool weather. In fact, weather that is too hot can make them bitter. To ensure that you will have optimum conditions for a tasty harvest, start Brussels sprouts seeds in seed starting medium indoors about 4 weeks before you plan to transplant them outdoors. The exact time will depend on the climate in your area, so find out when the first frost date is for where you live and work backwards from that date. You will want to transplant your Brussels sprouts outside 90 days before that frost date. Brussels sprouts are ready to be harvested when they reach 1 – 1 1/2 inches in diameter and they are best used within a day or two of harvest. If you have extra sprouts, blanch them in boiling water for 3-5 minutes and freeze. When you’re ready to try a great way to prepare your Brussels Sprouts, try Michael’s Brussels Sprouts Hash recipe. When I attempted to grow Brussel Sprouts ~ I got beautiful dark leaves and a tall straight stem….but no brussel sprouts. Why not? Do you have to have more than 1 in the garden? It is possible that it didn’t have time to mature fully. You can also try cutting the top 6-8″ from the plant as well as the lowest (and biggest) of the leaves. 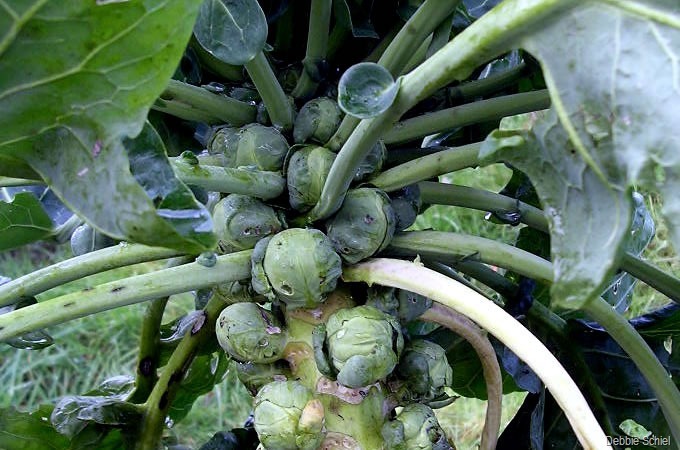 The sprouts will form where the leaves begin at the stalk.